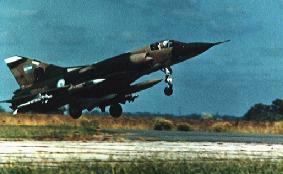 Aside from the land battles, most of the war was fought between Argentine aircraft and the British ships and carrier-borne Harriers. Argentine losses were heavy, but so was the Royal Navy's, and only the hit on "Glamorgan" by a land-based Exocet at the end of the war was not due to aircraft. Just before the San Carlos landings, this is a useful point to summarise the main Argentine aircraft involved and the losses they sustained, as well as inflicted. Adding the aircraft of the Argentine Coastguard (PNA) and Army Combat Aviation Battalion 601 transferred to the Falklands, all of which were destroyed or captured, plus two Navy helicopters lost at sea brought total losses from all causes to a round one hundred.